The creators and writers of CBS Elementary have taken so much creative license with Conan Doyle's original characters that the series could almost be subtitled Sherlock in Wonderland. I must admit though, I was hooked at the pilot. The series, 114 episodes (2012-2017), is now in its fifth season. As a detective series, the story lines are excellent. There are enough deductions, red herrings, and twists to demand attention, but I have to think that these characters have gone way beyond what Conan Doyle could ever have imagined. Jonny Lee Miller's Sherlock departs physically from the original character. At two inches below six feet he's a bit more compact, but a fine physical specimen with tatoos, which he inks on himself. Although socially awkward, Jonny Lee's is the most deeply caring Sherlock of the lot. 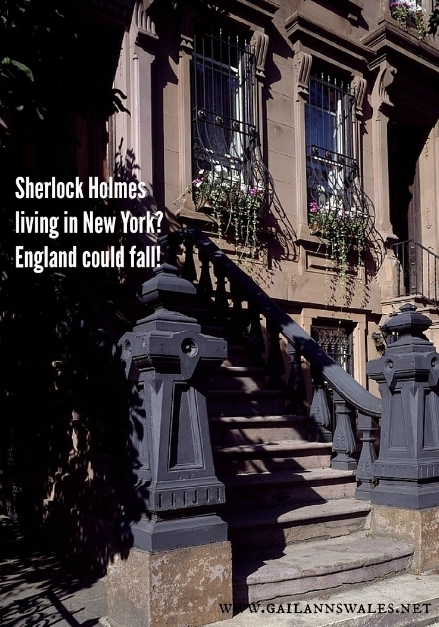 His contemporary Sherlock descends into drug addiction and immigrates to New York when he believes his only love, Irene Adler, has been murdered. I won't give away "the woman's" secret identity, but will say that Irene's and Sherlock's relationship goes way beyond platonic. Sherlock as a sexual being is quite a departure from his usual cerebral portrayal. Aside from Irene, Sherlock's other dalliances don't involve romance, but are what he considers a necessary part of his physical health regimen. He often eats bran flakes for the same reason. Dr. Watson is hired by Morland Holmes, Sherlock's father, to be Sherlock's "sober companion" when the detective emerges from a drug rehab facility. Sorry to say, I resisted watching the series for years because Dr. John Watson has been re-imagined as Joan, a surgeon/sober companion/consulting detective. When I finally did watch Elementary, I found Dr. Watson played brilliantly by Lucy Liu. Her character develops a deeply caring friendship with Sherlock which remains (thus far) strictly platonic and professional. In Elementary, absolutely every character has undergone a transformation. Morland Holmes rivals Moriarty in his power and nefarious business dealings, and Sherlock's brother, Mycroft, is a restaurateur with deep ties to MI6. Captain Gregson, is an American NYPD police officer, not a minor Scotland Yarder. Lestrade, Sherlock's favorite Detective Inspector in Conan Doyle's version, remains a British Scotland Yarder, but is a credit-grabbing fraud who rides Sherlock's coat tails to a lucrative position in America. Moriarty and Mrs. Hudson, well, I'll leave them as surprises for new viewers, because they certainly surprised me. I have very much enjoyed Jonny Lee Miller's rendition of Sherlock in Elementary. Thank you, Jonny Lee for adding to Sherlock's versatility.